Reforesting burnt and cleared areas of forest is an essential part of our conservation work. Replanting trees prevents soil erosion, expands wildlife habitats and reduces fire-risks; it engages local communities in conservation; and it contributes to the global fight to stop climate-change. Our seedling nursery contains over 5,000 trees from small seedlings to tall saplings, these are either collected from the forest or germinated from seeds and looked after in the nursery until we are ready to plant them. We are reforesting areas of recently-burnt peat-swamp forest, ex-farming and mining areas and forest patches that were over-logged in the past. 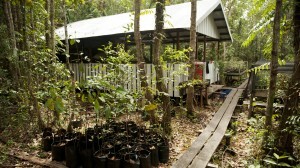 We have a long-term project studying how to assist reforestation in some of the most damaged regions of Kalimantan, by identifying the best species for replanting and the best light, water and nutrient conditions for tree survival and growth. Our primary research site is the degraded sedge swamp on the edge of the Sabangau River, a barren grass and fern covered landscape that used to be a tall riverine forest, but burnt 50 years ago, has lost most of its peat soil, floods every wet season and burns during the dry season. Despite these extreme conditions we are having success at establishing certain tree species in the area. As well as the nursery at base camp in the Sabangau Forest, we are introducing new ‘Family Nursery’ projects in local villages. These involve local communities in our restoration work to increase awareness, develop closer ties with our programmes, provide economic support, and use local knowledge and skills in furthering our restoration objectives.